Come watch the dolphins play at Sea Breeze, one of the most popular buildings on Madeira Beach. Vacation without a care in the world at our gorgeous, 1 bedroom, gulf-front condo. Time to relax. You have arrived in Paradise. Directly on the Gulf of Mexico, our home away from home has been completely remodeled. We have decorated with care, to make you feel at home. The kitchen is filled with everything you will need to prepare your meals. There is a king bed in the bedroom with a t.v., dvd player and movies. There is a murphy bed in the living room. This allows for the comfort of two big beds in two separate rooms. For all you sports fans... the living room has a 46'HD flat screen t.v., a dvd player and a library of movies. Free cable high speed internet is available for your use. Our condo has all the amenities of home and more. A pack and play crib, beach chairs, sand toys and floaters are in the closet for your use. There is a large, private balcony with spectacular views of the Gulf of Mexico, the pool and the powder white sand beach. Sit and enjoy the beautiful sunsets and watch the dolphins as they swim by. This unit is located on the fourth floor, overlooking the beach, heated pool and hot tub. There are gas and charcoal grills, with a picnic area by the pool, for your use. Beach cabanas are available for rent. Take a walk down the beach, a 1/4 mile to the famous John's Pass Village, where you will find an old fashioned boardwalk with shops and restaurants galore. Over the bridge and you are at Gators, one of the world's largest waterfront bars. Try para-sailing, jet skiing, rent a boat or take a cruise up the inter coastal waterways or just relax on the beach. But, most importantly - ENJOY YOUR VACATION! We have been regular visitors to Madeira Beach and we simply decided to make our dream come true. The Sea Breeze building is superbly maintained. The area allows you to simply relax or enjoy the charm of John's Pass which is near by. The rental cabanas come in handy if it is windy or a little cool and you still want to be sitting on the beach. 7eleven is right across the street and open 24 hours, for late check ins. We loved this condo for its layout and location the minute we visited it. This very spacious condo allows you to feel the beach at all times from the kitchen and large living room. We take great care in our home away from home and have equipped it to meet your needs. The setup is very relaxing as you can enjoy the sunset from your private balcony. 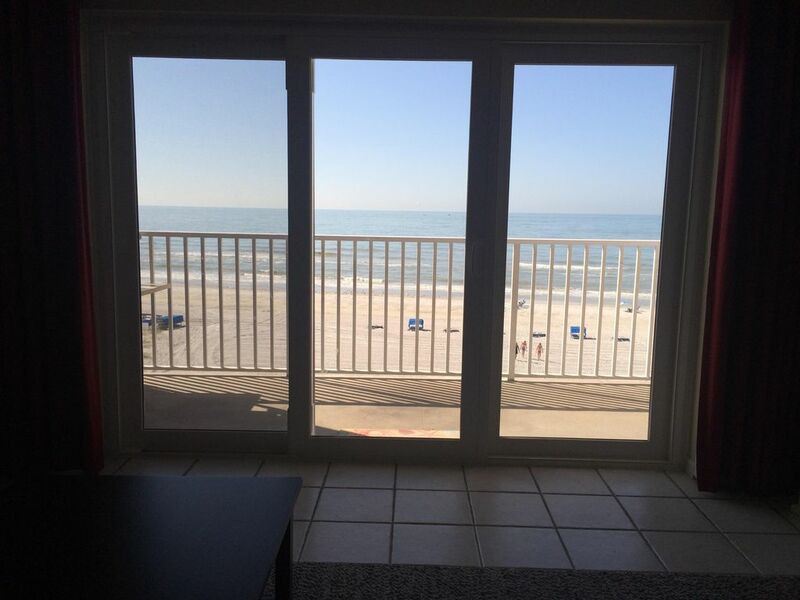 Also, it is just about guaranteed that you will see dolphins swimming and playing in the ocean while you sit on the balcony during a stay at our condo. Condo 405 is stocked with everything you could need for any length of stay. Beds, television, electronics and kitchen are all in good order. The furniture, while being simple, is comfortable, functional, and easily cleanable. We really enjoyed our stay. Only two things is that we didn’t know about the elevator code (until my husband couldn’t get back upstairs) and the shower does not get hot enough. We did not check in until after hours so we didn’t get to speak to anyone so if we had they probably would have made us aware of the elevator code. We also want the only ones who wasn’t aware of the code. Another couple had asked us the next day about pool codes and elevator codes. The view is awesome. The condo was clean. I liked that the laundry facility was on our floor however there is not a coin changer. Kitchen had everything that we needed. We enjoyed our stay. Our 3 year old had so much fun. Thank you very much for your review. We are very happy that you enjoyed your time spent at the beach. We apologize for the elevator code not being communicated, it should have been part of the of the information package when you picked it up. We will ensure it is communicated both at booking time and in the info package as well. As for the shower temperature, it has been adjusted due to feedback it was too hot. We will recheck. Excellent condo and owners were wonderful to deal with. Very clean and up to date with everything you ever would want. Very nice updated condo unit with private internet. Maintenance of the pool area could be better by washing off the tables and chairs rather than just hosing them down with a little water. The pool and spa should be cleaned well every day, many bugs and dirt in them. BBQ grill igniters did work properly. We cant say enough about how wonderful our stay was. you preferred to not go onto the beach. Location, location, location. Amazing sunsets, walks on the beach and a swim in the pool. We definitely would love to go back if they would have us. Definitely will recommend to our friends. Thank you to the owners for allowing us to stay there. Rates are eligible to change until reservation is confirmed.